Come Join The Halloween Fright Fun! We will kick off the fun with Trivia at 4:30pm EDT, followed by Spades tournaments and the main event - The Pumpkin Contest! Don't know how to play Spades? Not a problem! Watch for that "BaronessMorticia". She will be dropping the word or a graphic "Pumpkin" in the lobby. Be sure to be the first to type the word "Pumpkin" after she posts hers so you can earn "Pumpkin" points. At the end of the night players with the most "Pumpkin" points will win a special Halloween trophy. Join the trivia fun and joking around while you listen to Croatoan Radio and their wonderful group of DJs. They will dedicate their time in supporting Gaming Safari to entertain you, the players. 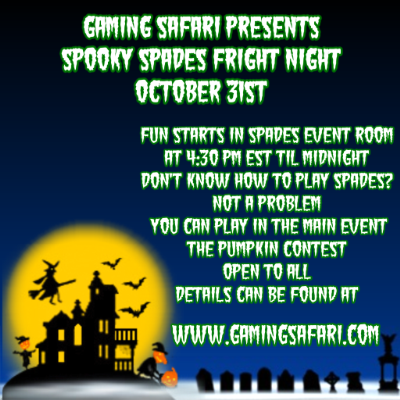 Spooky Spades Night is open to all Gaming Safari players (all games and all league/ladder players). Scare easily? You might NOT want to sit at our tables and play! Wuahahahahaaaaaaaa!! !